Mixing old-time spirituals and newly written original songs, this collection invites the body to join the heart in praise and worship. You've heard her soaring voice in concert and her soulful, spine-tingling vocals on gospel, jazz and pop recordings. 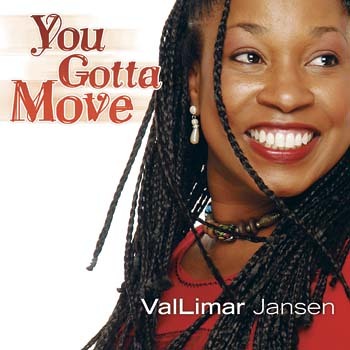 Now ValLimar Jansen -- the supremely gifted person behind that incredible voice -- has released her first solo album. It ain't called You Gotta Move for nothin'. Mixing old-time spirituals and newly written original songs, this collection invites the body to join the heart in praise and worship. It's an easy invitation to accept. Hands, hips and feet can't help but move to this compelling blend of rhythms and styles-fast and slow-from R&B and gospel to Motown, pop and hip-hop. Recorded in Los Angeles with producer-extraordinaire Ted Perlman (Chicago, Bob Dylan, Elton John, Natalie Cole and many others), the album features a superb backup ensemble, including Val's virtuoso husband Frank Jansen on piano and keyboards. Modernized and beefed up by layers of extra bass, percussion, backing vocals and Ted's production wizardry, these familiar tunes have never sounded so good. Val belts them out with verve, leaving no doubt that she believes every prayerful word. "I Want Jesus to Walk with Me" includes a clever, original bridge and a righteous rap by Val. "I Love You, Lord" opens with a stylized rendition of the refrain from Burt Bacharach's classic "What the World Needs Now," tenderly sung-and spoken-with help from a children's choir. "How Can I Repay" and "I Surrender All" are impressive new tracks, as is "Universal Church," which gets your attention with Latin and jazz styling, a refrain in English and Spanish, and a mesmerizing flute solo. Nothing tops the title track, though, with its wildly changing tempos, infectious beat, and its gentle warning, "'Cause when the Lord gets ready, you gotta move." "I would love to preach and the Lord be glorified," Val sings in "Let Jesus Rise." She does indeed preach through this music, and the Lord is surely glorified. It's something you just gotta hear. You’ve heard her soaring voice in concert and her soulful, spine-tingling vocals on gospel, jazz and pop recordings. Now ValLimar Jansen—the supremely gifted person behind that incredible voice—has released her first solo album. It ain’t called You Gotta Move for nothin’. Mixing old-time spirituals and original songs, this collection invites the body to join the heart in praise and worship. It’s an easy invitation to accept. Hands, hips and feet can’t help but move to this compelling blend of rhythms and styles—fast and slow—from R&B and gospel to Motown, pop and hip-hop. Recorded in Los Angeles with producer-extraordinaire Ted Perlman (Chicago, Bob Dylan, Elton John, Natalie Cole and many others), the album features a superb backup ensemble, including Val’s virtuoso husband Frank Jansen on piano and keyboards. Modernized and beefed up by layers of extra bass, percussion, backing vocals and Ted’s production wizardry, these familiar tunes have never sounded so good. “I Want Jesus to Walk with Me” includes a clever, original bridge and a righteous rap by Val. “How Can I Repay” and “I Surrender All” are impressive new tracks, as is “Universal Church,” which gets your attention with Latin and jazz styling, a refrain in English and Spanish, and a mesmerizing flute solo. Nothing tops the title track, though, with its wildly changing tempos and infectious beat. “I would love to preach and the Lord be glorified,” Val sings in “Let Jesus Rise.” She does indeed preach through this music, and the Lord is surely glorified. It’s something you just gotta hear.